I was wary when my friend Patty invited me to a trunk show called CAbi that she was hosting. In New Jersey a trunk show generally means a body bound and gagged in the back of an Oldsmobile. In this case, however, it meant a wine-infused suburban moms shopping spree in a friend’s Country French inspired living room. Home trunk shows have become the Tupperware of women’s fashion, a hassle free way for women to purchase high-end jewelry, upscale clothing and custom handbags without the side effects of mall rage. Plus, it’s a good way for women to connect, socialize, and discover who’s had chest enhancement. CAbi is a clothing line made exclusively for home party sales. CAbi clothes are designed not for teens, models or fashion plates, but for regular women who may not get dressed in business attire each day, but still want to look civilized when they do their “life” stuff, like walk the dog, shop for groceries, or go to CAbi parties. I wanted to balance out my wardrobe. Like my stock of Tupperware, I had more bottoms than tops. My wardrobe consisted of jeans, Levi’s 101’s. That’s the style number. It’s also the number of pairs I own. Jeans are a staple to any wardrobe because they answer to any occasion. Unlike, say, the poncho, that’s limited to Mexican fiestas and the 1970’s. “Terri,” our platinum blond trunk show consultant, stood 5’ 8” and weighed 98 pounds. This 38-year-old modern day peddler was not your grandparent’s bearded street merchant with a cart. She was Malibu Barbie’s mother, with a body that looked like she spent more time scaling Mt. Everest than selling an urban clothing line. Unlike department stores that use trick mirrors that flatter the body (the kind that make you look great in the dressing room, but that your bedroom mirror yells, “What the heck were you thinking?”) CAbi uses a trick wardrobe to accentuate a woman’s figure. “Our wide waistbands help tuck in tummies!” Terri explained. She lifted her chic, “Boho Blouse” to reveal a wide waistband attached to the stylish, “Lacy Skirt” draped on the wire hanger that was her hipbones. “Some of our blouses are designed with features that elongate the torso to make you look taller,” she said, modeling a tailored, button down cotton blouse that was shorter in the middle and longer on the sides. Terri did in fact look taller, if you’re into that funhouse mirror kind of look, but unless she was trying to conceal a two-gun holster, I viewed the look as a fashion disaster. The other ladies, however, seemed to love the blouse, and the concept. Terri enlisted Patty to model the draped tank, a sleeveless top in a floral print. Magically, the chest enhancing front pleats caused her breasts to mushroom an entire cup size. “I’ll take one of each color!” Patty cried. Terri wasn’t just hawking clothes. She was selling a dream. By the time Terri finally let us loose to “attack the rack,” the ladies were as liquored up as gamblers at a Las Vegas casino. They grabbed at the merchandise. One woman yanked hard at a blouse, which bothered me, because I was wearing it. It felt like a Janet Jackson Super Bowl moment, only nobody cared. At the end of the evening I glanced at Nancy’s order from. She had bought three dresses, two blouses and four pair of slacks. And Patty had earned over two hundred dollar’s worth of clothing by hosting (which explains why I’ve been invited to three CAbi parties in the last two months and haven’t been invited to a Christmas party in five years). I’m glad that I attended the CAbi trunk show, because I bought something that I really liked: a new pair of jeans. I plan to wear them to my next occasion—a CAbi party. The one I’ll be hosting. Great post! I have a complete visual of the evening. I have a Cabi coat that I bought several years ago – a long duster with a tapestry blue print over a robins egg blue background – it is equal parts Princess Diana and rock star. I feel fabulous when I wear it….which I do with jeans! Thanks for starting my Monday off with a laugh! Thanks! Your coat sounds wickedly cool! I’ve never heard of this brand. Around here I’m invited to buy baskets [Longaberger] or more kitchen stuff [Pampered Chef] but never to be better dressed. Perhaps our priorities are out of whack! lol on that one. So true. I haven’t been to any kind of “home party” in years. I think the last one was Pampered Chef. I could use some of those wide waistbands. Maybe Cabi will catch on around here or maybe it already has and I haven’t been invited because my friends don’t want me to look good. hmmmm. As long as I don’t look like a Yellow Cab in their stuff, I might buy something. But I have a feeling I’d be thinking, “That girl needs to eat a biscuit! !” I will have to look into these parties. Sounds like fun torture! Very funny. I have never heard of these parties – this coming from a Terri who is not so tiny. If they have “double Cabs,” I’m in. Sounds like any returns may be made due “wine-goggles” instead of mirror deceit. That’s why I stick with jeans. They still look good the next day . . . This rings so true. I received a call from a fellow softball mom asking me when I wanted to host the jewelry party I’d apparently agreed to host. I can only imagine I agreed at some softball tournament when the parents and I were tail-gating in the parking lot and I obviously imbibed too much wine! Ha! If you wear that same necklace and outfit and invite men to your CAbi party I bet you’ll have a great turnout! Thanks! I’m so glad you enjoyed it. I loved your alliteration! I have never heard of home truck shows, so obviously I don’t get out much. I love jeans and I wear them almost every day. They go with every top I have and they’re comfy. How can you go wrong with another pair of jeans, really? This post is a treat! I’ve never heard of CAbi parties, but they sound very much like makeup or jewelry parties of the same ilk. I love how you describe the whole thing — I was right there with you! — and peppered it with details (like how much Terri earned). Now you’ll have to follow up with a post telling us about YOUR party! The parties can be fun to go to, but I think it’s more fun reliving it on paper! 🙂 Thanks for the kind feedback. I believe we share the same philosophy when it comes to the women’s clothing industry and shopping. Malibu Barbie’s Mom – I love it. What a great memory and story! And cool Nana! As a small child I remember Beeline ! Thank you for the memory . I’ll be hosting my first CABI party on Nov 10TH. 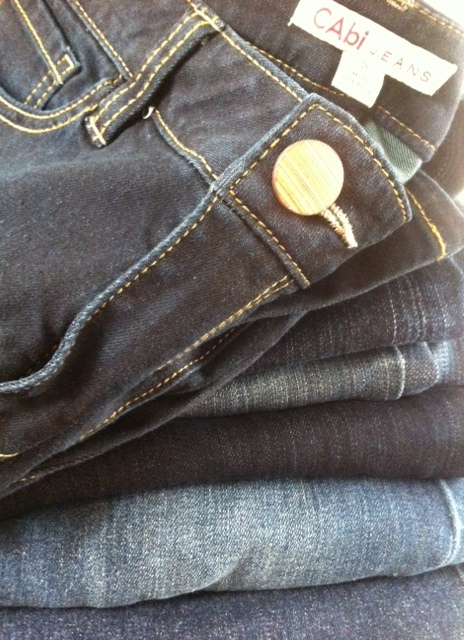 Home shopping is a pretty popular activity in my neck of the woods, as my jeans drawer can attest to! It was my Nan’s skirt – I thought it was in honour of her. LOL! I’m sure she was touched. And probably so were you . . .
That sounds like a really fun time!!! My neck of the woods trunk shows meant exactly what you thought LOL!!! NOW IT”S SHOPPING WHOO HOO!!! I loved the top you described; do you do any double dealing or reselling goods you bought? OK, I laughed out loud at the New Jersey trunk show comment, and didn’t stop laughing until… well, I still haven’t. I’ll see your 101 pairs of jeans and raise you 103 pairs of sweatpants. Ha! I’ll see your 103 pairs of sweatpants and raise you 101 dalmations! Hilarious, Judy! You have to riff off that in a future post! That’s a real compliment coming from you, Lisa. I’m still chuckliing over your line: “In New Jersey a trunk show generally means a body bound and gagged in the back of an Oldsmobile.” BUT, thanks for the suggestion on the blog idea. Never heard of CAbi parties, but now I know. Enjoyed the post! LIsa – We just adore your post. Your honesty and wit definitely appeals to the modern woman! So glad you enjoyed attending Patty’s CAbi Show and we’re thrilled to hear you’ll be hosting one of your own. May we suggest you invite Sherry and her 103 sweatpants? We have a wonder fabric called Ponte that will give her the comfort of sweats with the look of tailored, chic outfit. Loved this story. I’ve done KikaPaprika, but not Cabi. Can I narrate for my podcast? I’ve never heard of a CAbi party. If they had clothes that could made me look taller and thinner that would be a magic show, not a fashion show. Fun post – I really felt like I was there with you!! One comment: I truly detest a lot of the women’s dress tops at this time: they are often wide, floaty styles which look awful on a small/slim person. So for your Cabi party, just make sure you stock up styles that don’t make midlife women look like tanker trucks/dowdy. Sorry, am brutal here. I’m beginning to believe that the reason why such fashions are popular are to mask some weight problems.. The wide cuts are awful on me. And don’t even get me started on the off-the-shoulder trend . . . I have not heard of Cabi, but wish I was there. If the other ladies were daring no trick department store mirrors, so most surely would I. Sounds like great fun. Alas, sitting over her in Australia!! ooh, Australia! Some place I long to visit! NOTICE THE DATES ON THE REPLY MARCH 2013 all 2013 kind of outdated !!!!!!!!!!!) SORRY EMAIL FROZEN TEX ON MESSSAGES MARLENE C.
Such wonderful, self-deprecating humor-well done! When I first moved to Kiawah I was invited (aka suckered in) to a trunk show for “Worth” clothes. They were gorgeous and very expensive but beautiful, and I way over-spent because it was one-on-one with the sales person. 10 years later I am still wearing a few of the pieces, but I gave 2 pieces to Goodwill with tags still on them:-(. Needless to say, that was my last time at a Worth party! Sounds like in hindsight it wasn’t “Worth” it. 😉 Thanks for sharing. Great post made me smile, I to have never heard of Cabi here in the UK. Your so right about Jeans love them one good pair is worth more than I can say. Hi Lisa, loved the post and more specifically, your sense of humor. Just when you think you’ve heard it all, we learn something new everyday on line. And we were real happy to hear that the party was the second one you mentioned not the first that is, bodies tied in trunks. lol. This was the first time, either me or my daughter had heard of this kind of party. And we’ve been to a few. Home Interior, Night-light, (shake-party) which I can never remember the catch phrase it went by, but the girl was selling diet shakes. And a few others that were less memorable. We happen to agree with your assessment. “A great way to socialize.” Or at least, catch a great wine buzz. lol. Looking forward to following you and reading more of your great posts sweety. Well done!! Glad you clarified what a shake party is, I might have guessed something entirely different, something more like a twerk party. 😉 Thanks for the fun reply, looking forward to staying in touch. The same concept was popular in the 70’s in the Deep South with Beeline Fashions… The hype, smooz, and plentiful supplies of liquor made those little forays into fashion a smashingly delightful trip. Never heard of them but I enjoyed your post. Funny writing. Another excellent post. I love your writing, regardless of the topic. I went to a CABi party and I was so excited as I was new in town, a stay at home mom, with zero family around. I had a glass and a half (darn) of wine and some really awesome soup. I hadn’t shopped for myself in years and I was ready to treat myself (darn). All the sizes were too big, but looked oh so cute when she sales rep snugged it in tight in the back. She encouraged me to buy all I wanted and if I didn’t like it or it didn’t fit, it’s easy returns through her. She then later tells me that since I spent so much at the last party that I probably wouldn’t want to come to the next one she was now having. Yes, I was officially not invited. What a story! Sounds like quite a cast of characters at that party. I can understand why you’ve come up with your own interpretation of those abbreviations. I suppose it could also stand for “couch and briefs.” 😉 Thanks for sharing! Omg! Couch and brief, I love it! I like it much better than my negative naughty acronyms ;). I really prefer humor over hate. These ladies think they are the cats meow, but I assume (or is it hope) that their struggles are great. That is horrible and not what is a typical cabi experience. I hope you were not treated poorly by the stylist you were working with? Did you keep the clothes? Remember as a kid being dragged by my mom to something similar except it was in the early 60’s. We were ensconced in an upstairs bedroom while mom and company watched demos of Tupperware or something. I have similar memories–and the moms were smoking cigarettes and sipping martinis. This made me smile, I can imagine the goings on. I have been invited to a few – lingerie, make up and kitchen supplies. “No obligation” – yeah right, you feel like you are freeloading if you don’t. I always politely decline. A trunk party is not a body in a trunk anymore? What’s the world coming to? I love the way you wrote this. I could picture it all so vividly. I’d never heard of CABi parties before. Maybe because everyone who knows me knows I hate to shop. But I must say… I’m intrigued. You learn something every day….I just did! I’ve never heard of Cabie before. Very interesting and sounds like a fun way to purchase clothes. This cracked me up. I am considering becoming a CABI Rep. So I am reading a lot of reviews. I am not too skinny that’s for sure, that makes me feel that I might be a good representative for the company.